The smoothness and matte white color of Lightolier’s recessed lights melt away into the ceiling. When illuminated, these complementary lights provide warm general lighting for the kitchen. 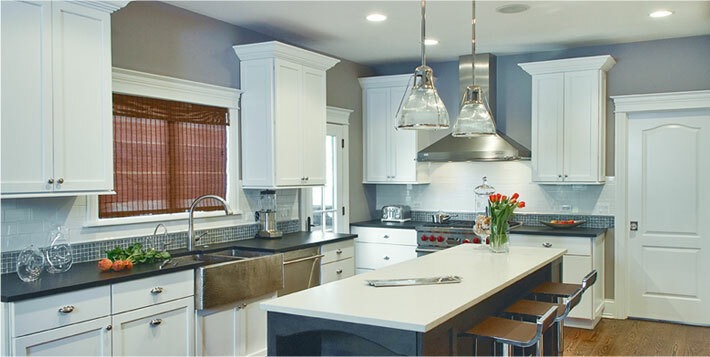 Add Juno LED under-cabinet lights for additional warm task lighting on the counter tops. The prismatic pendant’s clear ribbed glass and polished chrome detail adds the perfect amount of task lighting to the kitchen’s center island. Slender spider arms secure Haverhill’s metal-rimmed diffuser plate, adding a touch of sleek elegance. Hanging height may vary between 26.5” – 80”. 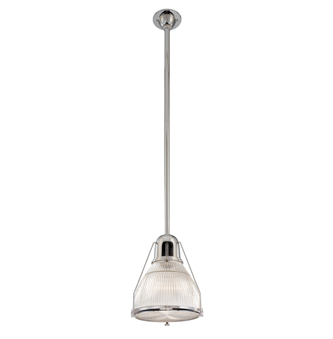 OPTIONS: Polished Nickel (as shown) – other options available. The Lytecaster 5” aperture cone reflector trim complete fixture consists of the reflector trim and frame-in kit. 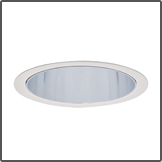 This versatile recessed light is available with LED or incandescent lamps, as well as several reflector trim finishes. This new addition to Juno’s Pro-Series duplicates the light level and color of halogen under-cabinet lighting using just 1/8 of the energy and virtually no heat. 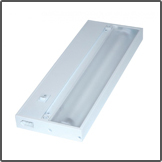 Features an amazing 50,000 hour lamp life and multiple fixture finish choices. The traditional lighting style is a mix of highly polished pieces from various time periods and countries, often seeking inspiration and designs from past centuries. Gentle curves and simple finishes shown in this kitchen are what characterize the traditional style, bringing a comforting sense of elegance, charm, and warmth into your home. With restrained ornamentation and fine woodworking, this style maintains a strong balance of luxury and simplicity.